We take pride in our broad product offering of lab essentials and equipment that we manufacture for research, clinical and industrial laboratories. for safely working, transporting and short-term storing of slides. Customizable tube rack, multiple configurations for 5 mL/15 mL and 15-17 mm tubes. Compact yet packed full of high-end design features making it a versatile shaker for a vast range of protocols. Lightweight and sturdy to hold up to 24 full specimen containers. Disposable, lightweight and sturdy to hold up to 24 full specimen containers. 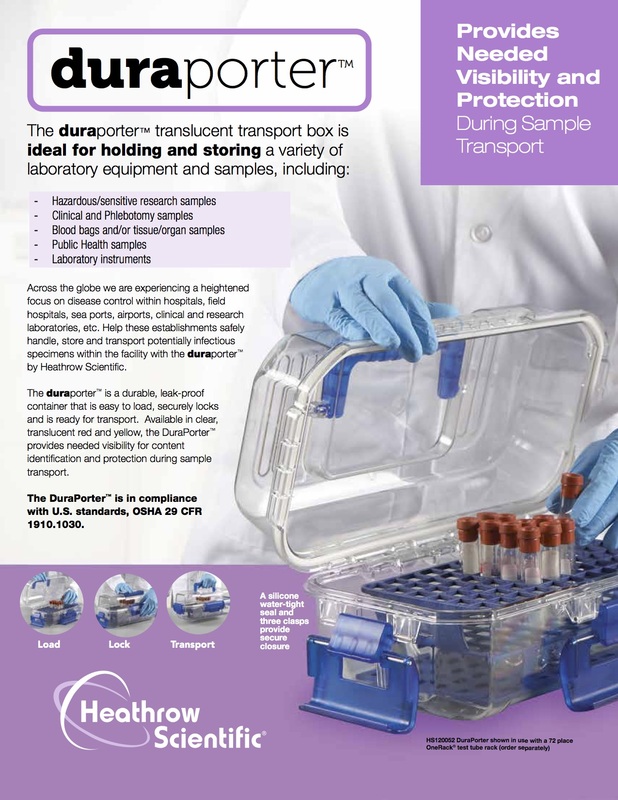 The DuraPorter® translucent transport box is durable, leakproof and ideal for holding and storing a variety of laboratory equipment and samples. Simple to use colony counter for counting cells in microbiology applications or tissue culture. 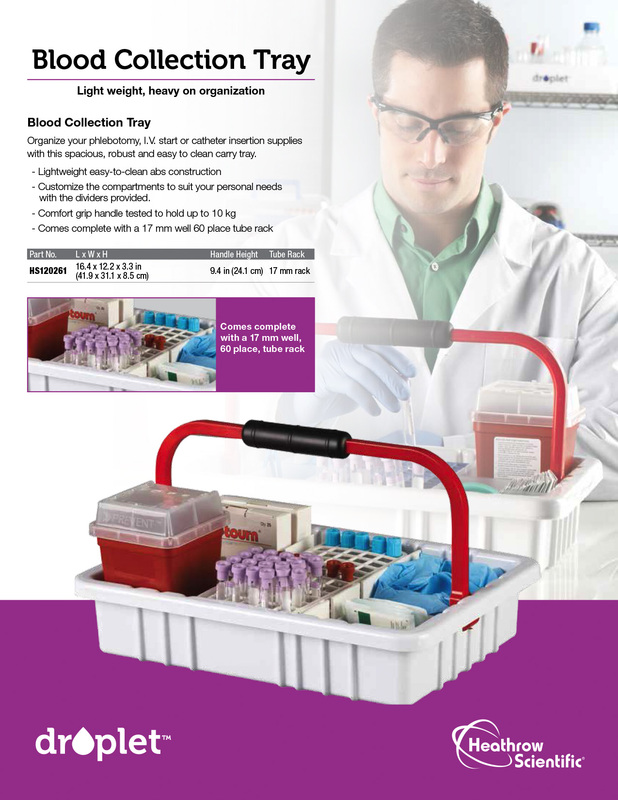 A unique pipette holder that can stand on the bench top, or it can be hung under a shelf to help maximize your working space. It holds most common brands. Maximum speed and flexibility, the Gusto® high speed mini centrifuge has a compact design that fits any workstation. Terry cloth gloves provide durability and long wear with heat and abrasion resistance. Introducing the Heathrow Scientific Equipment Family. Reusable, reliable, and reversible, an economical solution to help keep benchtops clean and safe from stains, spills and wear. 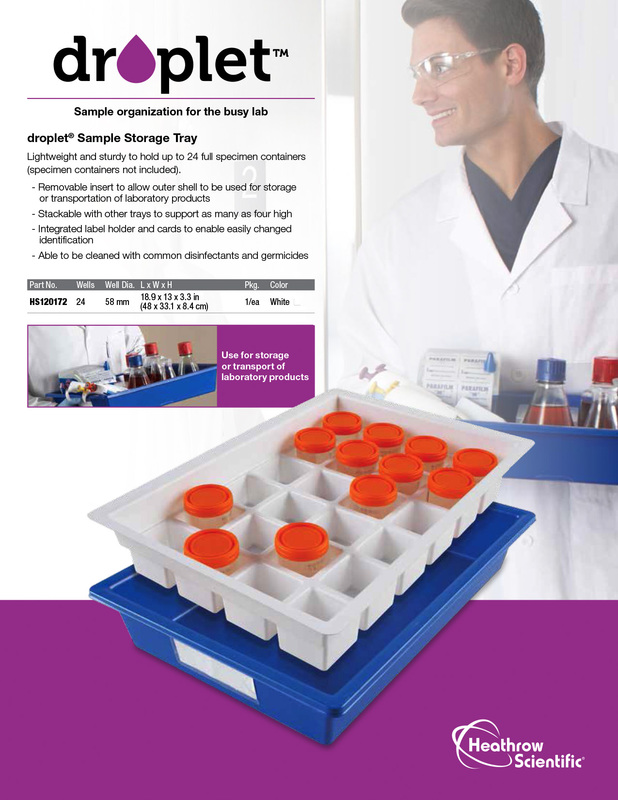 Easily organize common lab products off your bench top with the MagLab™ storage system. Strong magnetic coupling with consistent accurate alignment. The small and slim footprint saves space on the bench-top and can be conveniently stored in a drawer. An economical solution made for ultimate function. A simple, touch start operation enables exceptional mixing performance with one handed operation. 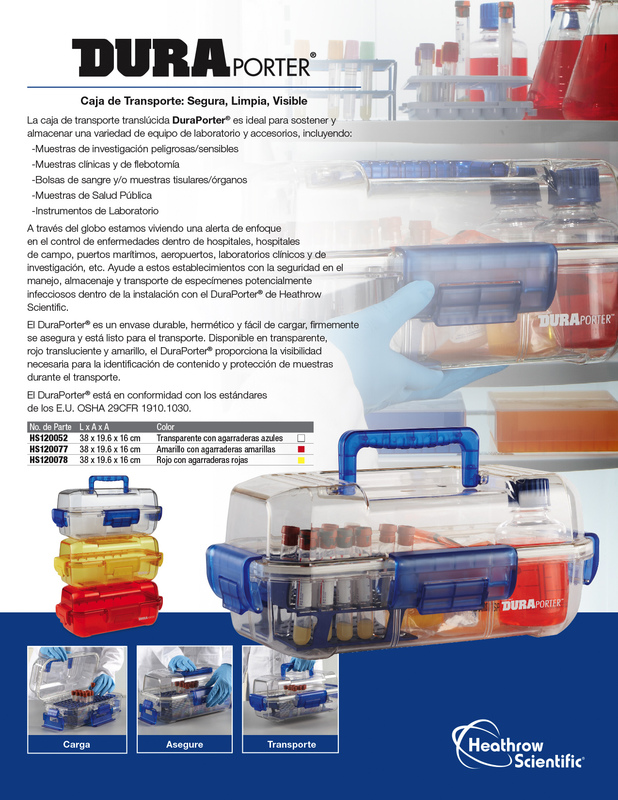 Perfect for transporting samples and reactions between preparation, thermal cycling and post-PCR® procedure areas. 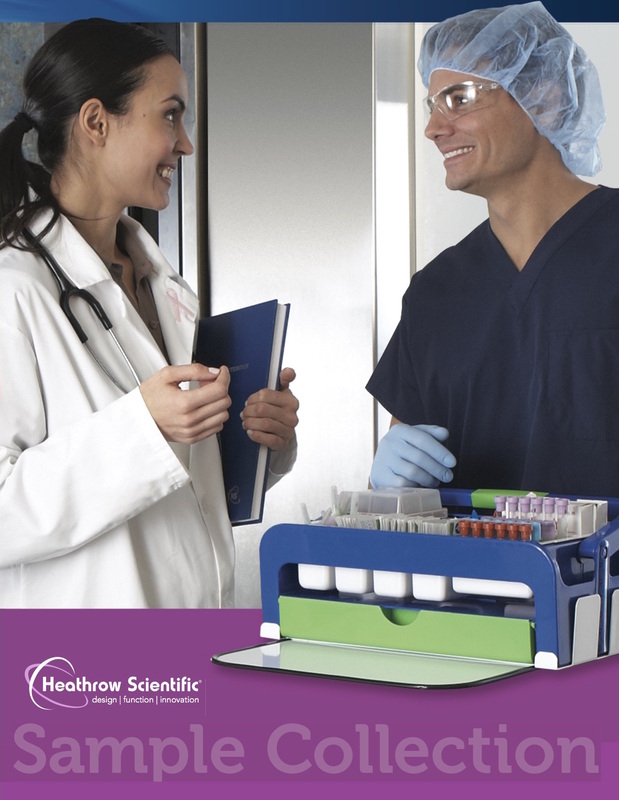 The PCR© Storage Rack, by Heathrow Scientific, offers a sleek and modern design that’s packed full of features. 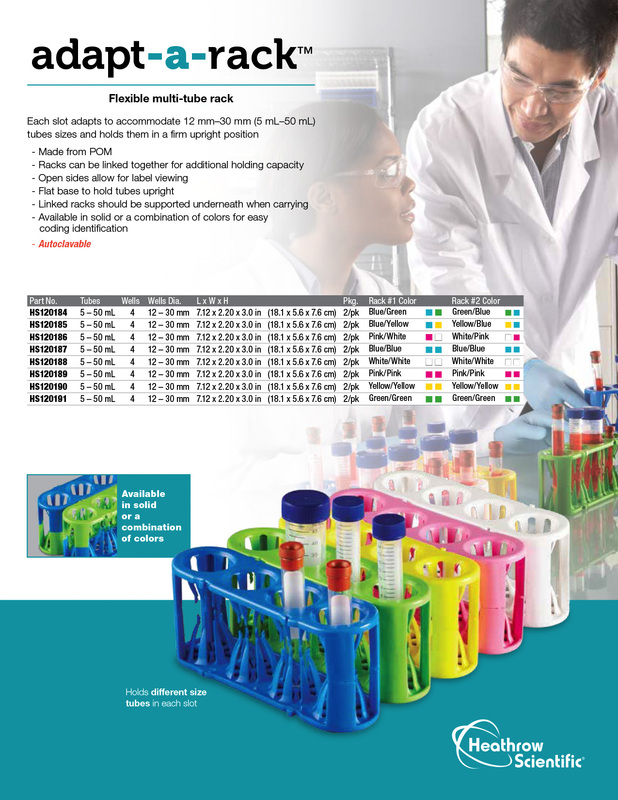 A complete range of single channel pipette volumes to cover all your possible needs. Convenient for new labs. 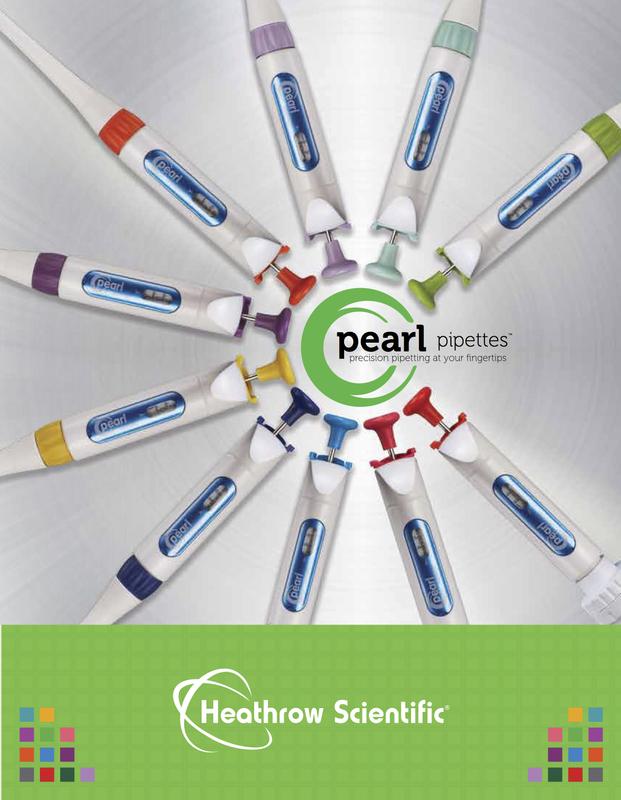 The kit includes 3 single channel Pearl Pipettes, a Universal Carousel Pipette Stand and Reagent Reservoirs. Comfortable to hold and easy to use, the manual inline pipette controller was designed with an ergonomic grip and bulb for simple and precise operation. Modern design for daily use. 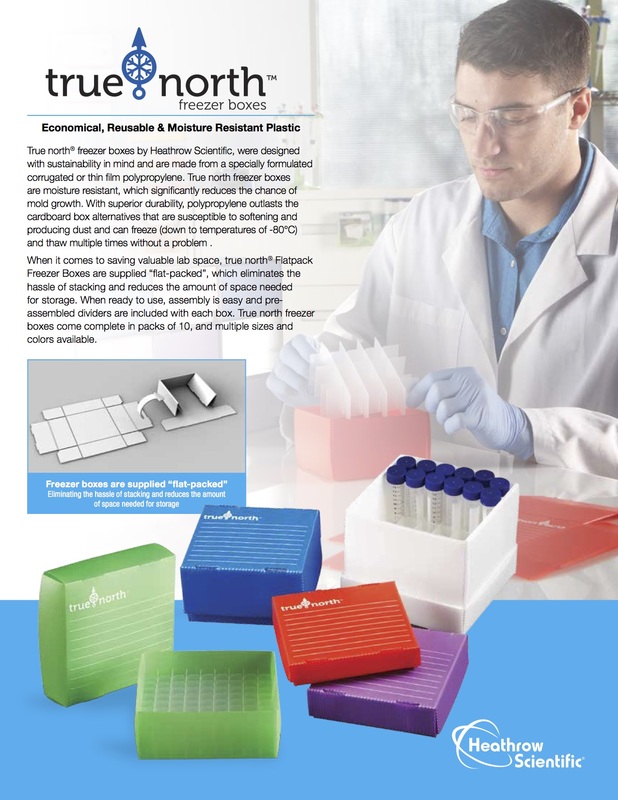 Reagent Reservoirs offer a fresh and modern design with enhanced features to streamline pipetting procedures. The RF1000™ is a manual pipette controller and is uniquely designed for one-handed operation. 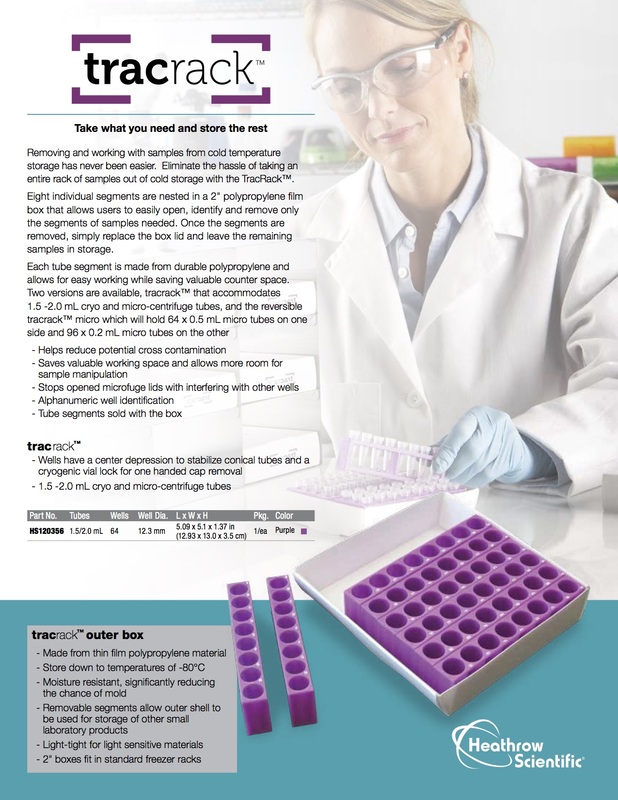 Packed with features for comfortable and accurate pipetting. Microprocessor controlled for constant reliability and accuracy. Our lab essentials are distinctively made with functional style and bring a sleek and modern look, plus a spectrum of colors, to traditional labs. 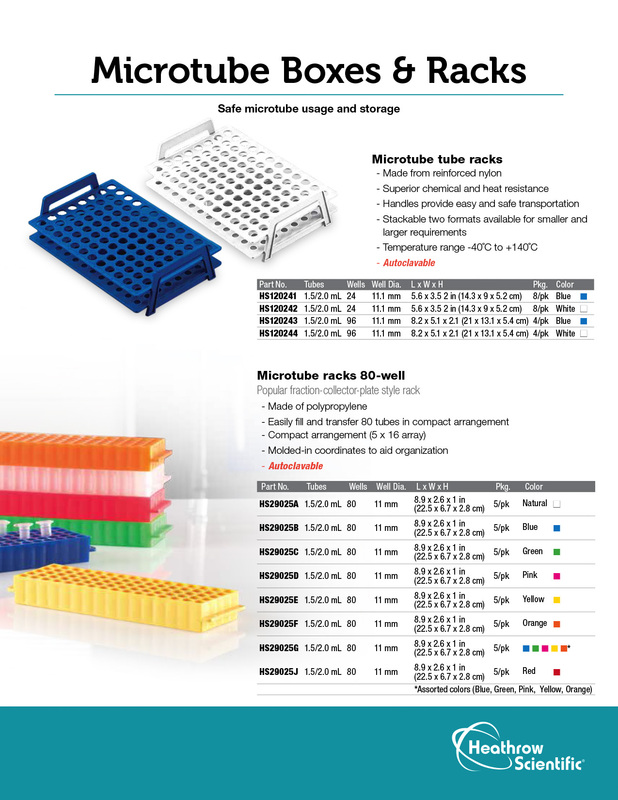 Corrugated storage trays are multi-purposed where they can be used with the included dividers to hold specimen bio. The dual purpose scoops are a unique economical solution that combines the function of a scoop, weigh boat, and funnel into one product. SmartBoats® are made from FSC® Certified (FSC® Mix) paper and when disposed of in the standard waste stream they will naturally biodegrade. 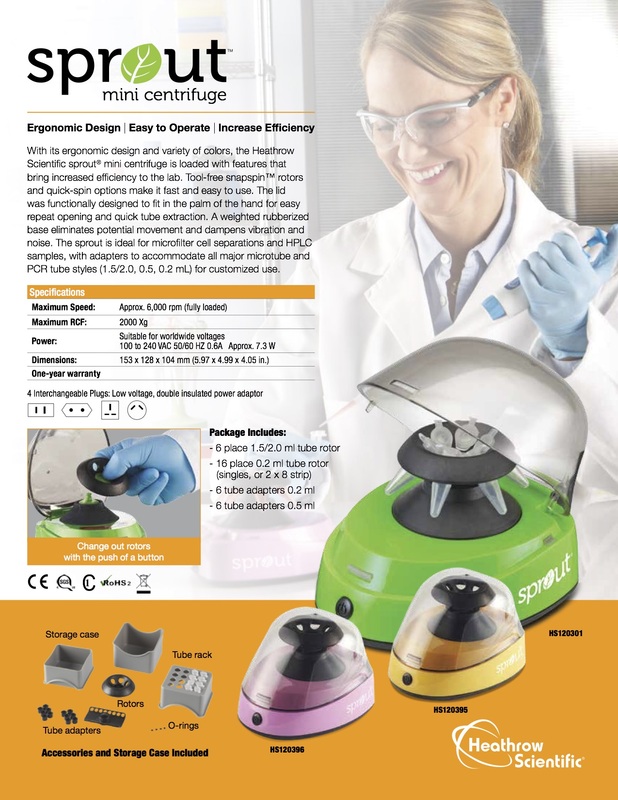 With an ergonomic design and variety of colors, the Sprout® and Sprout® Plus Mini Centrifuges are loaded with features that bring increased efficiency to the lab. Spin Samples On-the-Go. Enables the processing of samples before deterioration can take place and can be used in remote environments. 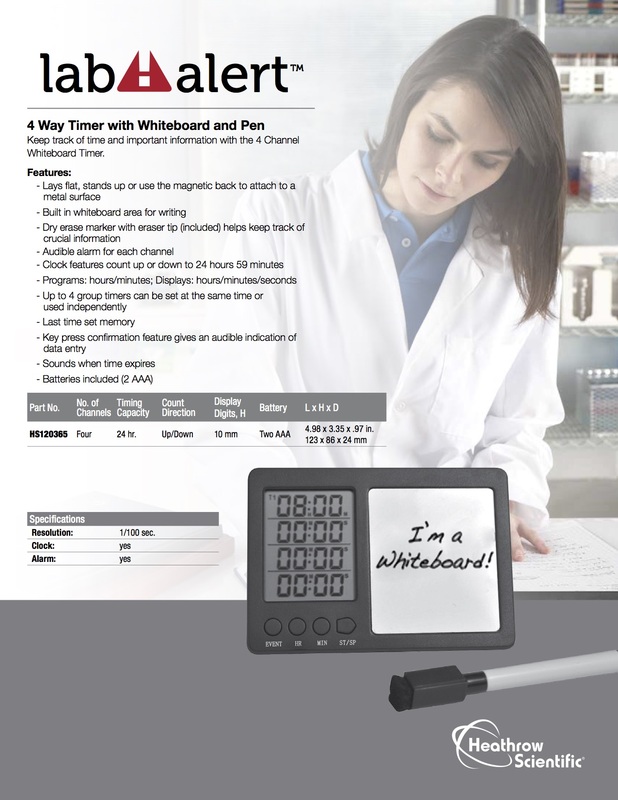 Keep track of time and important information with the 4 Channel Whiteboard Timer. It lays flat, stands up or can attach to a metal surface. 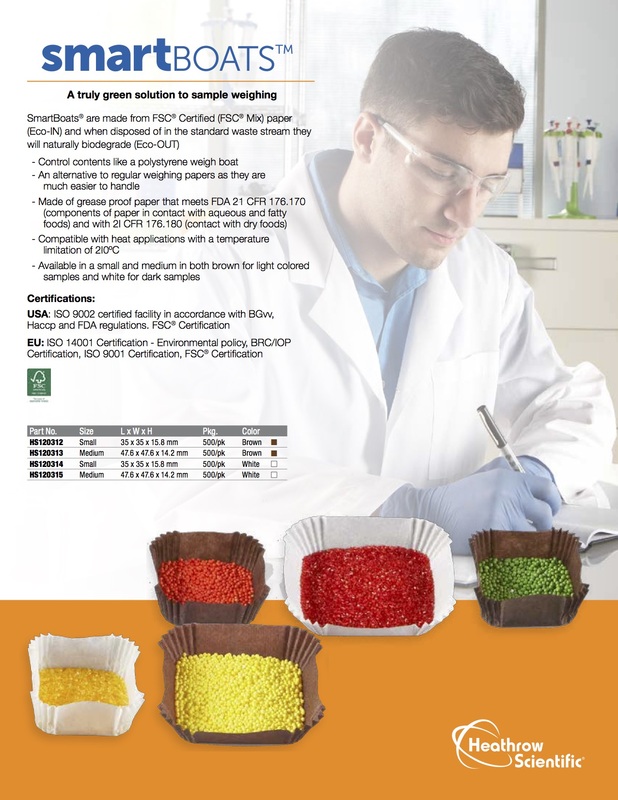 Working with samples from cold temperature storage has never been easier. 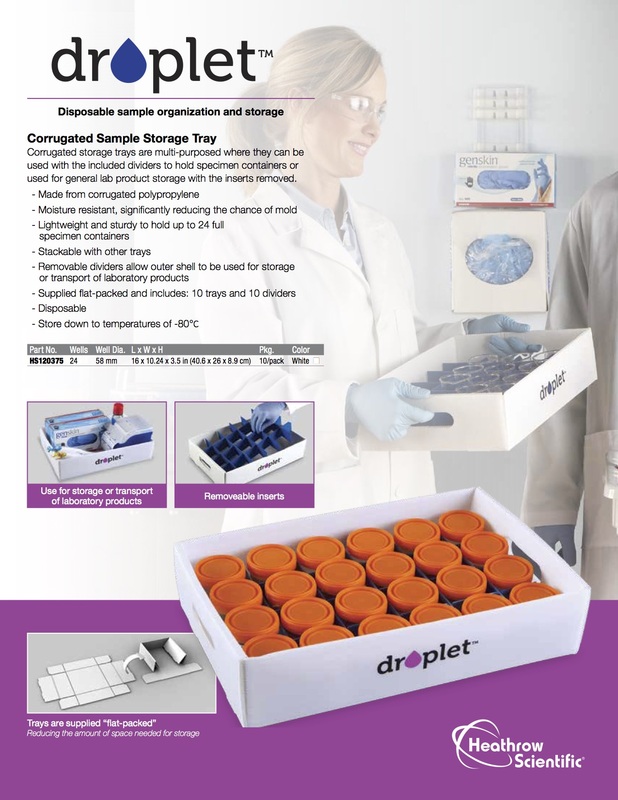 Eliminate the hassle of taking a rack of samples out of cold storage. True North® freezer boxes were designed with sustainability in mind and are made from a specially formulated corrugated or thin film polypropylene. Durable polycarbonate construction with a rugged stainless steel clasp provides safe storage and transport for 3x1" (25x75mm) slides. Hold and store pipettes in style with the new universal pipette stand that holds up to 8 single channel, 4 multi channel, or a combination of both pipettes. every known brand of pipette. Heathrow Scientific Family of weighing products to meet all your needs. 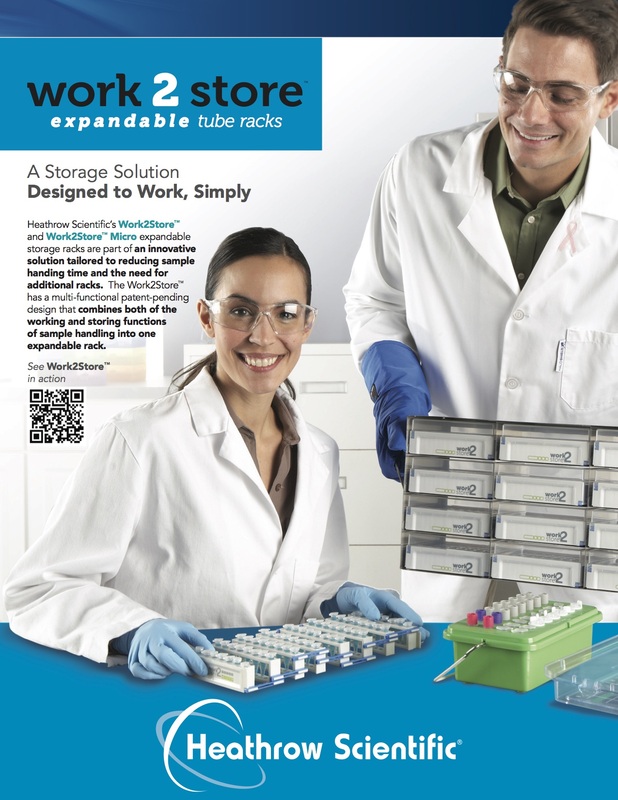 Work2Store® expandable storage racks are part of an innovative solution tailored to reducing sample handing time and the need for additional racks.